Josh and I have been on a big sous vide kick lately. 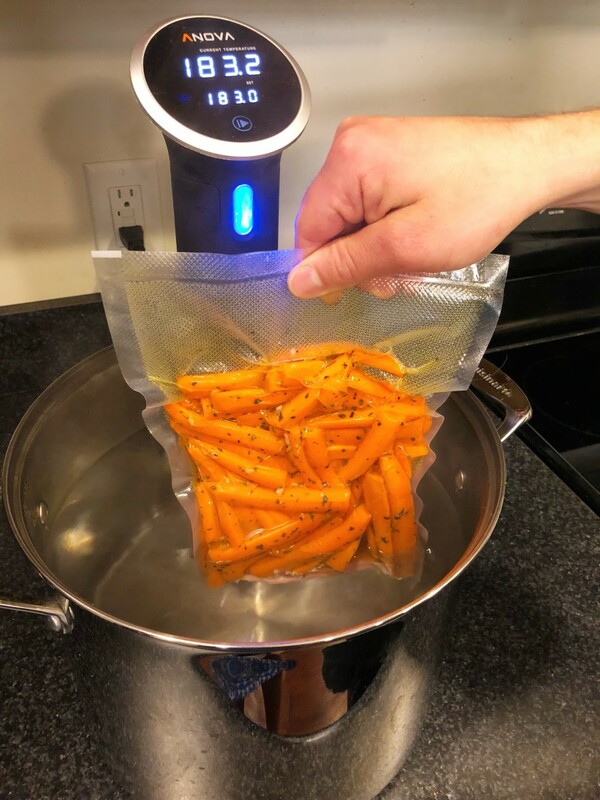 Sous vide cooking adds so much flavor to your food. It’s also incredibly easy to do, once you get the hang of it. I have been trying to pack our meals this summer with nutritious fruits and veggies. While I like carrots, I have never loved them. They just seemed like a meh vegetable to me compared to the incredible flavors of peppers, onions, mushrooms, and brussels sprouts. 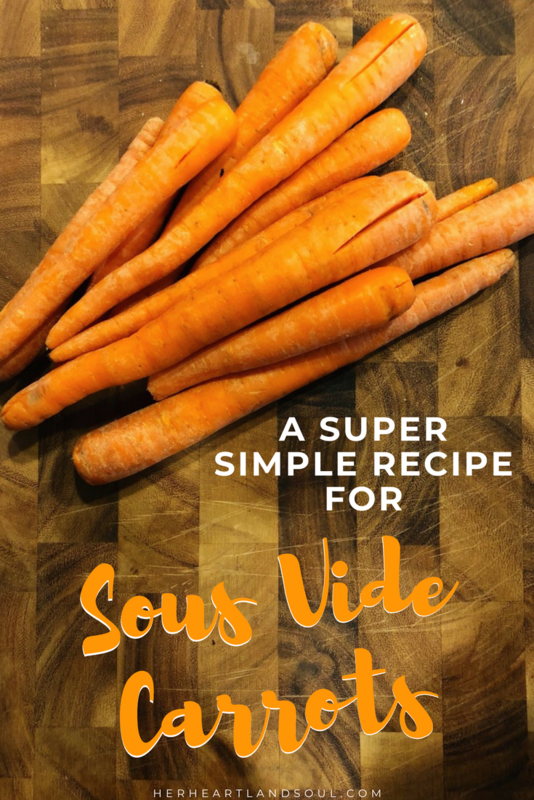 Josh loves carrots, and assured me that if I tried them cooked sous vide style, I’d be singing a different tune. 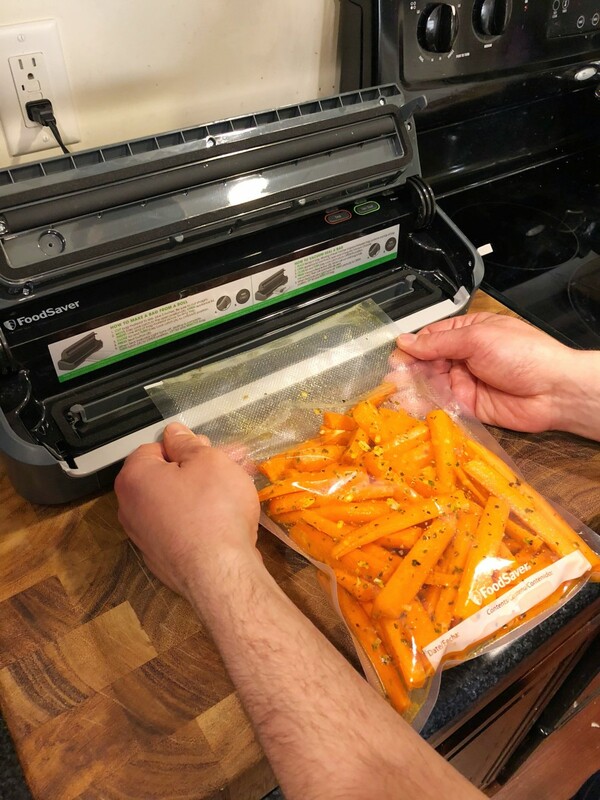 We spent a Saturday making sous vide carrots together, and sure enough, it was unlike any other carrot I’ve tasted. As Josh puts it, “it’s like eating a carrot stuffed with carrot.” Flavorful, juicy, and crisp. I am officially a fan. Before you start sous vide cooking, it’s important you have the right ingredients. 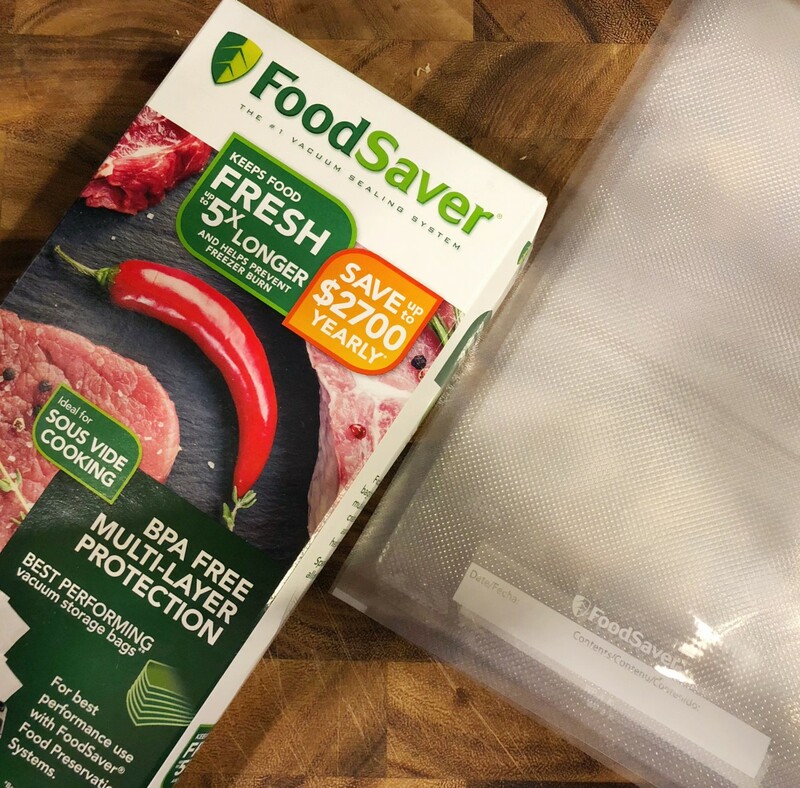 Josh and I use this sous vide cooker and FoodSaver® Sous-vide Vacuum Seal Bags and FM2000 Vacuum Sealing System. It’s important to use bags and a sealing system that creates an airtight seal to provide maximum flavor, and consistency while cooking. The FoodSaver system is top of the line. I love it because we can prep food in bulk, throw the extras in the freezer, and then immediately move food from the freezer to the sous vide hot water bath when we’re ready to cook. There’s no defrost required and the bags are incredibly durable. They’re microwave, fridge, and freezer safe, and come in a wide variety of sizes. The entire FoodSaver line is on sale for 15% off at Target this month. You can’t go wrong. Fill a large pot with hot water and insert the immersion circulator. Set temperature to 183 degrees F.
Finely mince the garlic and set aside. In a large bowl, combine carrots, minced garlic, sugar, basil, oregano, and olive oil. Season with salt and pepper and toss thoroughly until the carrots are evenly coated. 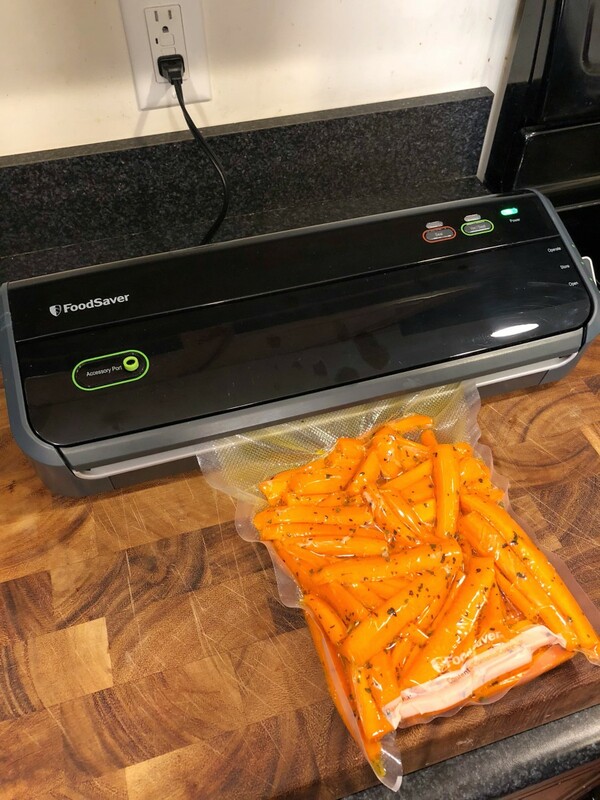 Transfer carrots to a one-quart Foodsaver vacuum bag and vacuum seal. Once the pot has reached the correct temperature, place the bag of carrots in the pot, making sure the carrots are completely submerged. Cook for 90 minutes, then remove the bag of carrots from the pot and set aside. 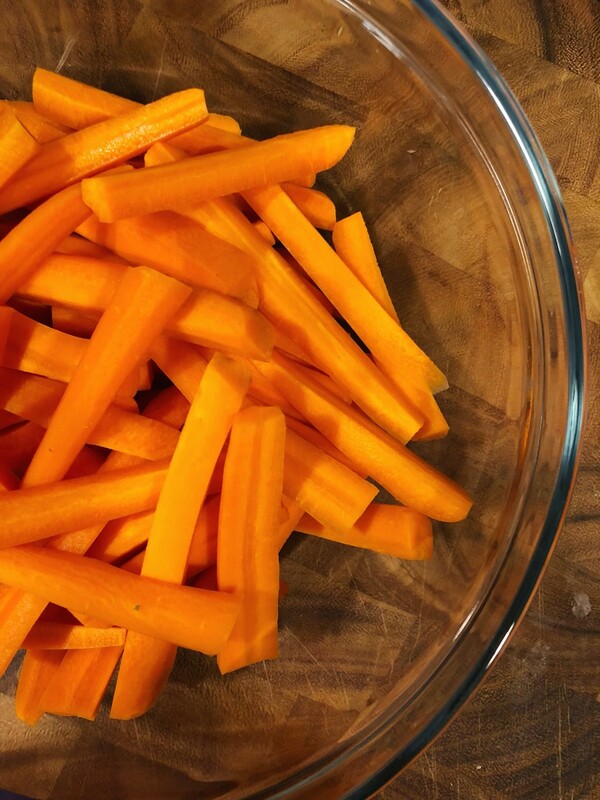 Heat a large pan over medium-high heat, then open the bag of carrots and pour the entire contents into the pan. Cook, stirring vigorously, until all of the liquid has reduced and it coats the carrots, about 3-5 minutes. 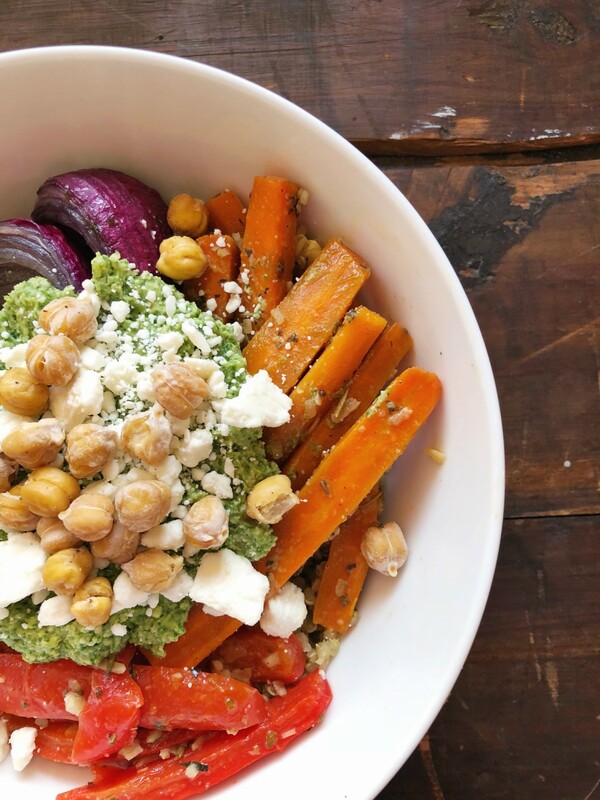 We added our sous vide carrots to a quinoa bowl packed with green sauce, feta, and veggie goodness. We plan on eating this recipe on repeat throughout the summer. Questions of the Day: Are you a fan of sous vide cooking? Do these veggie bowls look good to you? These sound delicious, and how convenient that you can get sous vide bags so easily! I was put off cooking with my sous vide because I couldn’t get bags except off the internet. My husband wants a sous vide so badly!!! That looks delicious. I have never tried any of those gadgets before lol. These look so good! I’ve never tried anything like that before! Oh my goodness, this sounds amazing! I will have to make an investment in the products to try it out, but I think I can find other uses for the them. Saving this for later! Thanks for sharing; that’s great you really liked your carrots cooked this way. I don’t think I’ve ever heard of this type of cooking before, but I could use a new way to eat more veggies since they aren’t my favorite. Haven’t tried sous vide cooking but this veggie bowl looks delicious!